Last week, severe flooding, along with dangerous landslides, caused by heavy monsoon rains, has caused the death of hundreds and the displacement of hundreds of thousands of people in the state of Kerala in southwest India. Along with the initial damages, there have been outbreaks of disease due to crowded conditions in refugee camps and due to the loss and destruction of sanitation facilities and equipment. This flooding is the worst seen in southern India in almost a century. The Rev. Peter Devassy, a pastor for our parent organization, the General Church of the New Jerusalem, lives and serves in the impacted region. He reports seeing severe hardship all around him, and is working to alleviate some of the suffering of the church’s neighbors there, including by serving on the management team for one of over a thousand refugee camps in the area. His particular camp is sheltering around 7,000 people. Rev. 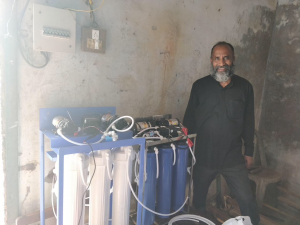 Peter Devassy stands next to water purification equipment in Kerala, India. I (Mac Frazier, Assistant Pastor at Glenview New Church) know Peter. He is a big hearted man. It breaks my heart that all these people are suffering in this way, and that Peter’s life has been turned upside down by this natural disaster, but I am consoled knowing that he is the kind of person you would want as a neighbor when things go wrong. It is a testament to the kind of person he is, as well as to the goodness of so many people in the New Church that there has been a swift and generous outpouring of effort to help Peter help his neighbors. Since last week, several New Church organizations have stepped in to be a part of this effort, and I am writing to encourage you to join in. First, the General Church of the New Jerusalem began immediately collecting funds to send over to Peter to be spent on recovery efforts. Second, an organization I am a big fan of, Charity in Action, has stepped up and is also raising funds to support relief efforts. Finally, multiple individual New Church congregations have taken steps to help. Glenview New Church is one of them. Donate directly to the General Church of the New Jerusalem. Go to www.NewChurch.org/give. Once there, be sure to select Indian Flood Relief from the Designation drop down menu before submitting your donation amount. Donate through Charity in Action. You can do this through their Facebook page (facebook.com/donate/265604277412103/10214807692297735/), their GoFundMe page (gofundme.com/flood-relief-in-southwest-india), via PayPal (to barefugeecare@gmail.com), or by sending a physical check to Charity in Action, P.O. Box 45, Bryn Athyn, PA 19009. Participate in the Glenview New Church Golf Outing. Every year we have a fun-filled golfing event to raise funds to support our mission. This year, 50% of all proceeds will go toward ongoing flood relief efforts in Kerala. The event will be held on September 22 at the Glenview Park District Golf Course. To participate, call Own Smith at 630-327-1966 or email him at Owen@abbey-paving.com. This recovery effort will take a very long time. Support will likely be needed for months to come. Please help us help those who serve their neighbors in times of need. For learn more about these events in Kerala, see this article from The Atlantic website.